What if Jesus had implemented a system of financial accountability? What would happened if Jesus, the Man himself, had implemented a system of financial accountability within his traveling preaching group? Why, for example, didn’t he have Matthew, a former tax collector, double check the income and expense books? Why did he full financial authority to just one man? If Jesus had set up a system of financial checks and balances, would Judas have betrayed him? 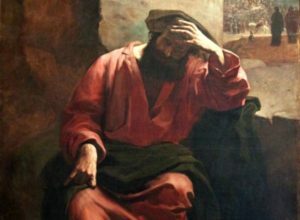 As in, did Judas – whom Jesus obviously trusted – start walking towards the dark side after he found himself in a position to skim a little money without anyone knowing? Or did his conversation to the dark side happen beforehand? Though we will never know the answer to these questions, we can learn from Jesus’ mistake and create a system of financial accountability. No matter how trustworthy a person is, it is never good to have one person in total control over the groups money. Let us, therefore, use some wisdom and make sure we keep the books clean and balanced (after all The Librarian likes his books well cared for – well that and bananas). Update: Sigh… it seems that the internet doesn’t like my comment that we can “learn from Jesus’ mistake.” This post isn’t an attack on Jesus’ divinity or anything like that. Making a “mistake” doesn’t mean Jesus sinned; it just means that Jesus was like us – as the author of Hebrew says – and lived through all the things that we did. I’m sure Jesus as a child make some mistakes while working in the shop with Joseph or helping his mother. Making a mistake does not mean he is any less of who he is just like me making a mistake doesn’t change who I am. Regardless of all this, I do believe that we can learn from what happened – hence this post. So please do not to turn this into something it is not. Thanks. All I get from this post is that you are a heretic who placed himself above God.